While Michael Schumacher was setting the speculators into a frenzy by setting fastest laps in Barcelona testing, Renault's Bob Bell was having a quiet moan about the standard ECU the teams will have to use in 2008. It does seem a little unfair that the 2006 champions have had to put up with two seasons in a row of starting off at a disadvantage to other teams. This year it was the switch to Bridgestone tires that effectively put Renault out of contention. So closely had they worked with Michelin, designing their cars around the company's products, that they were bound to have more trouble than most in adjusting to completely new rubber. And now the ECU comes along to complicate their preparations for 2008. Naturally, since it no longer makes provision for traction control systems, the ECU is simpler than the Renault technicians are used to but it seems that its implementation is also a good deal different from their previous Marelli-designed system. Bell points out that the time devoted to integrating the ECU with their car is time lost in other areas. Most of the teams are going to have similar problems, as they did with Bridgestones, but this time it will be McLaren that has a head start, since it was their company that designed the ECU in conjunction with Microsoft. Apart from the irony possible in that McLaren, if accused by the FIA inspectors of using Ferrari ideas in the design of their MP4-23, might not get to use the ECU themselves, this does raise questions about the wisdom of forcing competitor-developed technology on the teams. Thinking back to the beginning of the year, I recall Bridgestone's assurances that they would be completely even-handed in their supply and relationship with all the teams, no favor being given to their previous customers, Ferrari in particular. As things turned out, it may be that this was not entirely true. You may remember the fuss that was made in the WMSC hearing when it was mentioned that Alonso and de la Rosa had discussed "Ferrari tire secrets", and the famous gas used to inflate them. But how does this square with Bridgestone's earlier assurance of fair treatment? Note that, to check on what he'd learned, Pedro de la Rosa asked a Bridgestone engineer and was assured that the gas had been used in the past but without clear results. So Bridgestone knew what Ferrari were doing with the tires but did not pass on the information to other teams. Is that being fair? Surely the tire company had a duty, if they knew of something that improved the performance of their products, to pass on the information to all the teams, or they could be said to be favoring one over the others. And now we have a situation where one of the competing teams owns the company that produces an important component that all teams must use. Of course, McLaren maintain that they would not interfere with the production from their subsidiary and I believe them; but why does the FIA also take them at their word after a season in which they have accused and convicted the team of all sorts of underhand dealing? Anyone who has used a computer knows that there are ways and means for software engineers to insert undetectable tweaks into their products that do things they ought not to. That is the main reason for the FIA insisting on a standard ECU after all - to ensure that the ban on traction control could not be circumvented by hidden tweaks within the team's ECU. How much easier it would be for McLaren to insert code that favors their car over others. I have said right from the moment the FIA chose McLaren Systems as the supplier of the standard ECU that it was an obvious conflict of interests and that the contract should have been awarded to Magneti Marelli. Now we see the beginnings of the trouble that could result from such a foolish decision. If McLaren are allowed to compete next year and their car proves to be the quickest, how long will it be before suspicion arises around the ECU? Could the FIA have set up the sport for another year of wrangles over matters that really have no place in F1? Bad decisions need to be changed and I have no doubt that the initial choice of ECU supplier should be changed, even at the price of delaying the traction control ban one more year. Better still, they should ban ECU's completely and let the engineers work as they always used to work - without computers to fine-tune the engine for them. So there would be a few more engine failures? Rather that than these constant visits to the law courts to decide who wins what and why. I can't see ECUs themselves being banned in the near future - otherwise the FIA would probably have to abandon its pet plans for energy recovery systems and the like. At least for a while, and that doesn't suit the FIA's plans one little bit. The Bridgestone bias was new to me in terms of the exact details, but fairly predictable. In reality, the ECU supplier, along with the supplier of other standardised components, needs to be some organisation with no recent links to specific F1 teams. That might make the implementation stage a bit longer on the part of the chosen organisation, but all accusations of bias would be removed at a stroke (unless the standard supplier acted irresponsibly). 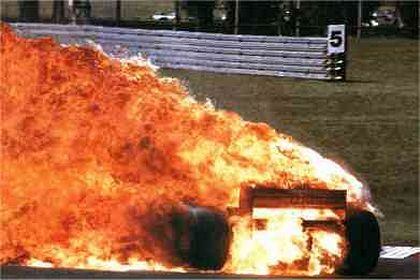 The proof of this is the fuel rig - Intertechnique had no known biases towards any F1 teams when they were made the sole supplier of fuel rigs. While we may complain about the quality of devices they supply from time to time, and even argue about whether fuel rigs should be used in F1, nobody charges Intertechnique with favouring any particular team. I realize that there's no chance of ECUs being banned, Alianora - that was just my old fogy's assertion that things ain't what they used to be. The matter of a conflict of interest being involved in the choice of a standard supplier of a required component was immediately apparent when the FIA chose the ECU last year. I do not understand why more of a fuss was not made at the time; had it been, the teams might not be in the difficulties they are encountering now. and Clive brought up the salient point, no one made much of a flap about it when the decision was first made. The time for complaining has passed. Live with it! Yup, they'll just have to live with it, Number 38. Goes to show it's worth kicking up a stink when something like that happens, rather than letting it ride because it doesn't affect you right now. At the time it was announced McLaren had been awarded the contract my first thought was that there would be a howl of protest particularly from Maranello. I have always liked the way Ron does business and in reality apart from Williams I can't think of another team I would believe if it said it was supplying a fair product but there is a clear conflict of interest. Imagine if Ferrari had supplied this year's ECUs and Lewis hit his little technical problem in Brazil. There would have been a lot of finger pointing. Max and Bernie from there actions over the years clearly have no understanding of conflict of interest but this is an incredibly stupid move. I blame Max more than Bernie for this one. I don't think Bernie has done much apart from the money-making side of the business for years. I agree that it is particularly unfortunate and inexplicable that McLaren have been awarded the ECU contract, but I suspect it would have been much worse if Magneti Marelli became the sole supplier because they are a FIAT company. The last thing the FIA want is more suggestion of Ferrari favouritism, regardless of how justifiable it is. That's true, Marty - I was forgetting that Marelli is a FIAT company. Heck, everything in Italy is owned by FIAT these days. But the ECU should still be supplied by a company without any connection to a particular F1 team to avoid any suspicions of favoritism. Sorry, i'm late to the diskussion again. Just got one little thing on my mind to ad here. McLaren and Microsoft working together sounds really bad. Microsoft: This company has been known for the last two decades or so to be the weakest company when it comes to hacker security. All their programs and hardware have always been dependent on external software or hardware to prevent hacking. Does this mean that every F1-car will have to install Norton Internet Security now?? McLaren: I have'nt watced a whole season without McLaren making some really bad mistakes and then having to chase the title at the end of the season even though it looked as if they had it in their hands midseason. Does this mean that this will be the common way of racing 2008 and forward?? You're probably right on both counts, Björn - looks like a marriage made in hell. By the way, for some reason, your blog won't let me comment. It keeps throwing up error messages when I try and I have given up. I am reading it, however, honest. Great stuff! I don't know what could be wrong over at my blog. But i have seen that it have been read a couple of times. But it could be that you might have to be a member in the opera comminity to comment blogs. I'm not as frequent in writing as you are, this being the place where i spend the most of my thoughts. Will try to ad something new as soon as possible, but sources to write from and that have not already been emptied by other bloggers and newsmedia is far between these days.